The monument marks the final resting place of Rev. Peter T. Van Houten who was a blind pastor who served several churches in our community. He had a remarkable horse who knew the routes and got him to the services. 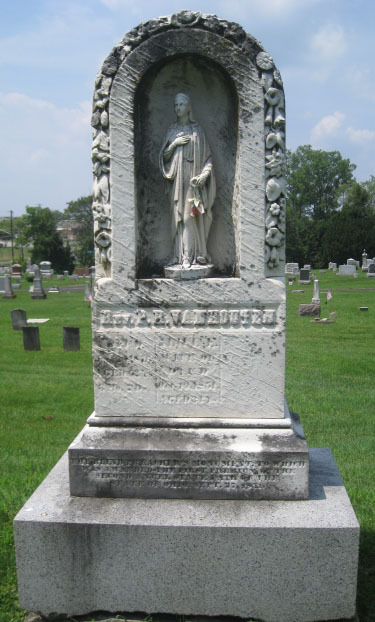 Van Houten was born in New Jersey on October 13, 1814, to David and Margaret Van Houten. In the 1850 census he is shown as a blind peddler age 34, married to Allice Sarah VanHouten (age 28) living in Berkshire Township, Delaware County. In 1851 the statue at the right won first place in the Ohio State Fair sculpture contest. It was called the Blind Preacher. In 1860 census Van Houten is a blind clergyman in Lincoln County, Tennessee, with his wife Sarah and 2 daughters Mary age 12 and Allice age 5. In the 1870 census he is a blind minister in Delaware with his wife Sarah and daughter Alice J. On January 20 1876, he was riding his horse home on a foggy night and his horse lost his footing along the Big Walnut Creek and they went over the cliff. The Blind Preacher was awarded the first place at the Second Annual State Fair of the State of Ohio September 27, 1851. It is unknown how the statue came to Sunbury.